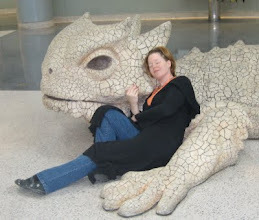 Clothdragon: Jealous of Husband's Office No More. Jealous of Husband's Office No More. Remember a few weeks ago, my manic rearranging fit where I painted my bedroom orange and got rid of the oversized furniture to repurpose smaller stuff we had scattered around the house and finally got a bedroom that actually looks big and pleasant? Also where I moved the second-bedroom-come-toyroom (my two are still sharing a room) and put ALL the toys into what had been the study (the carport closed in well before we bought the house) with bookshelves and Husband's desk, and we changed the room saved for kid2 (playroom) into an office for Husband and I stared at my office/sewing room with sadness because sewing stuff took up so much space that it always looked cluttered and messy no matter how clean it was at any time and was all jealous of his single-purpose clean room? 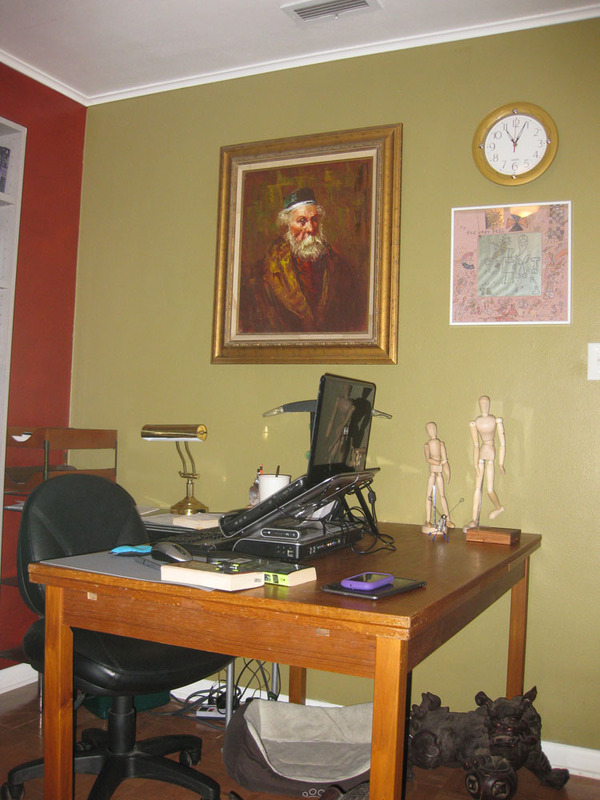 Now I have the most beautiful office ever and everything will be perfect once I convince my brain that we don't need to keep rearranging and it is now time to settle in and write. 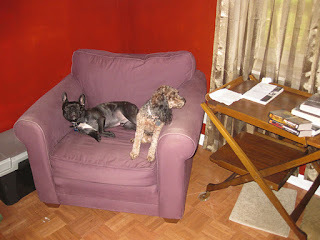 See, here is my reading spot -- temporarily taken over by the dogs. My writing desk with Nostradamus looking over me. garage sale and I really have no idea why I liked it at all. Sometimes I think he's a spy and is very suspicious of everything I do. 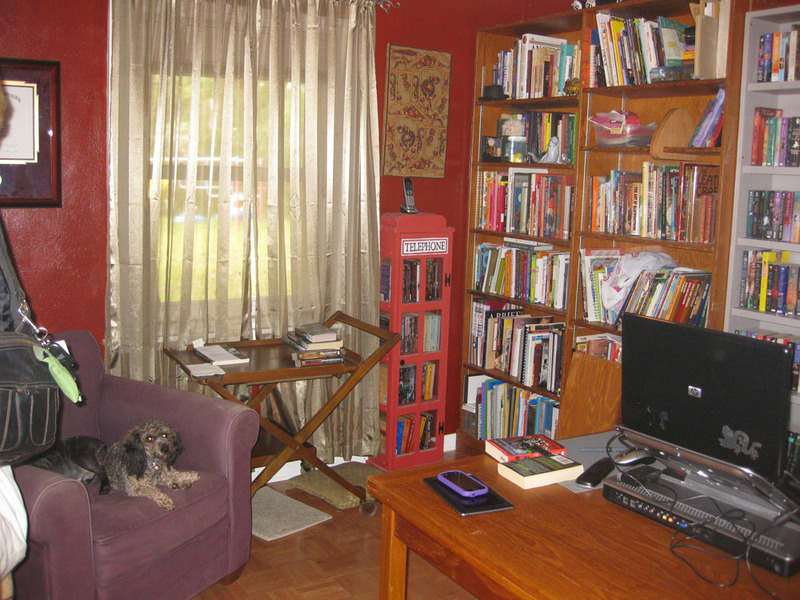 This is a wide view from the door to show my wall of bookshelves. I haven't decided whether I'll use Dewey Decimal or Library of Congress organization. 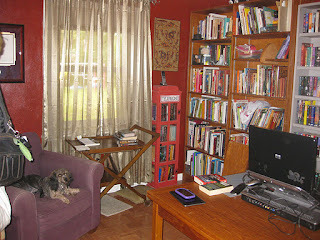 The smaller, gray bookshelf is all fiction and alphebetized by author. 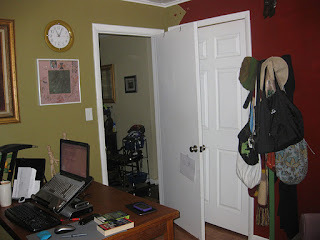 And this is the door where I ran out of red paint and left the other wall green. I stopped in a point above the door because I hate painting the corners between door frames. The arrow makes it look purposeful, Right? Also new, from the thrift store, is the clock so reading time doesn't get away from me. It ticks loudly, each second a reminder of the time I've just lost. It may be in cahoots with the Nostradamus painting. I need to figure out photographing small rooms -- older house, bedrooms are all 10x10. These pictures still look cluttered when it really does look beautiful now. Now I have to write things worth a beautiful office of my own. I think I need to nap now. Looks awesome! I love it when an office comes together....that sounds very dirty. I'm jealous. Wish I had an office all to myself. It looks very nice. Thanks, Barbara. (I searched the post for the dirty comment I missed, then realized it was the office coming together. *headbang). I guess a 1900 sqft garage counts as a barn and I do really like it but it certainly feels more like a barn than a proper office. Perhaps I should take inspiration from you and get off my duff to make the space what I want it to be. It's exhausting, but worth it -- except now Sheard and I have both been retreating to our own beautiful spaces more. Even while the kids are up. We'll have to stop that before it becomes habit to keep some family times.